I think we can all agree that life is just easier in summer. It's sunny, warm, and you can spend your free time sunbathing at the beach, swimming in the lake or doing yoga in the park. But what happens when it gets a little colder? All these fun outdoor activities you've been doing to improve your mental health become obsolete! I guess you could say that parts of self-care are seasonal, but don't let these good habits you've formed slip as the leaves turn yellow and the sun turns into snow. 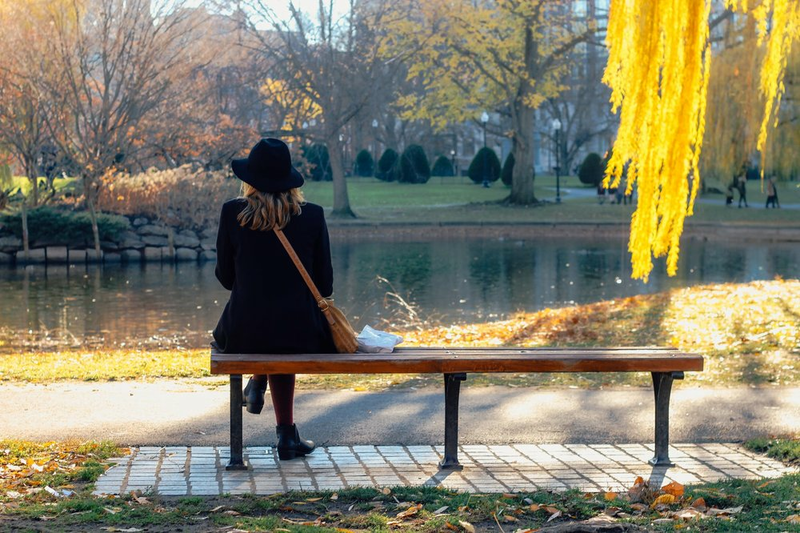 Here are 6 mental health tips for self-care during fall and winter. I think this is how introverts meet each other. I love this first idea because you can combine a hobby with meeting new people. As someone with social anxiety, I constantly must push the boundaries and meeting new people often is part of this. Keeping social anxiety in check is definitely part of my self care routine. Also, who doesn't love a good book?! This is a great idea for fall, as most book clubs meet up in a cozy bar or pub and you can sit next to an open fire sipping on a mulled wine/cider or a hot chocolate, with other like minded folk and discuss your favorite books. To find a book club, head to Facebook groups for your community or city and see if anyone is posting about it. If not, why not make the first move and assemble a book club of your own? For a lot of us, looking good on the outside correlates to how we feel on the inside, so don't let your beauty routine slip this winter. It's a good idea to treat yourself to a new thicker face moisturizer and a winter-proof lip balm. Let's avoid chapped lips this year! If you are anything like me, you might get dry skin and cracked heels over the winter, so be sure to stock your bathroom with a few extra products. Also, as the seasons changes so should your fragrance. For winter, I like something earthy, spicy, and mysterious. Sikkim Girls by Lush ticks all of those boxes. It wouldn't be one of my lists if there wasn't something outdoorsy involved. Even though those outdoor yoga sessions are seasonal, a great way to stay fit during fall and winter is it go hiking. Just remember to wrap up warm, take a packed lunch and get some proper hiking boots. If you live near mountains or a National Park that's great, but for those of you who live in the inner city, why not take public transport to the outskirts of your city and explore? To find hiking trials, cycling routes and more visit your local government website. Charities and other good causes are always looking for help as the weather gets colder, and helping someone else leaves you with a warm, fuzzy feeling like no other. You can volunteer at a fall festival, a charity run, a soup kitchen or at the animal shelter. Or do something kind for your elderly neighbor like raking their leaves or cooking them a hot meal. When I used to live in England, there were homeless people on every street and it was incredibly sad to see. If you can't find any place to volunteer, make some care packages for the homeless instead. Add ready to eat food items, socks, toothbrush and tooth paste, a sweater and feminine hygiene products for ladies. If you haven't got much money to spend, create a Facebook post and see what your friends and family can donate. Then, walk around your city or town and hand them out to the homeless. Fall calls for lots of pumpkin, squash, and other delicious seasonal vegetables. What could be better than having a night in with your friends enjoying and delicious fall-themed meal? Serve this 1 Pot Caribbean Curry with some hot mulled wine and you are good to go! You've heard of the Spring Clean, but what about the Fall Closet Clear Out? Right now is the perfect time to donate or sell clothing you don't wear, throw out all the socks that have holes in them and create some extra space in your closet for cozy sweaters, scarfs and hats! I firmly believe that having a clear out is good for the soul. Material possessions aren't all that, and living a more minimalist, conscious lifestyle has some incredible benefits. Alright, that's all of my self-care tips for fall and winter. I hope you enjoyed them and that you promise to look after your mental health all Winter long. If you've got any additions to this list, please comment below, I'd love to hear them.